Geography teachers love the Nile Delta because it so well epitomizes what a river delta is — clear demonstration of the delta form, in real photos. 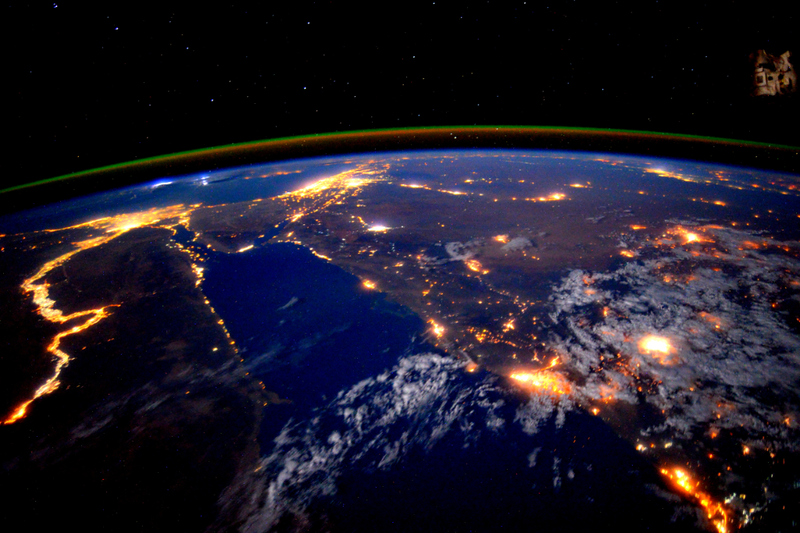 The Nile becomes a river of light, showing the advance of electrified human settlement along the banks, and providing stark contrast to the unlighted desert on either side of the river. What other cities, landmarks, or geographical features can you identify in the photo? National Geographic Society reminded us they’ve had to change maps of the arctic. National Geographic Society composed this GIF to compare their maps over past 16 years: A GIF of National Geographic atlases from 1999 through 2014 shows how Arctic ice has melted over time. President Barack Obama noted the change in his announcement of U.S. actions to fight climate change. National Geo added details beyond what the president said. At the last edition of the National Geographic Atlas, a video described why and how changes were made. We used to think the old Earth was so massive, little could humans do to change it. While it’s probably still true the rock will survive after humans are extinct, we now know we can foul our nest enough to make it uncomfortable, or impossible for our species to stay here. Global warming is changing the planet. Maps must be changed to show the new face. Have we acted soon enough, and hard enough to save space for humans to live? Tip of the old scrub brush to Chris Tackett on Twitter. World Malaria Day 2014 – How can you help beat the disease? Time for a big push to smash the disease’s hold on humanity, maybe eradicate it. Are you in? No, DDT is not the answer, not even much of AN answer. How can you help, right now? Send $10 to Nothing But Nets. Bednets are dramatically more effective than just insecticides, in preventing malaria infections and saving lives. Your $10 donation will save at least one life. Write to your Congressional delegation, and urge them to increase funding to the President’s Malaria Initiative. Malaria does well when people in non-malaria regions turn their backs on the problem. Malaria declines with constant attention to nation-wide and continent-wide programs to prevent the disease, by diminishing habitat for mosquitoes, curing the disease in humans so mosquitoes have no well of disease to draw from, and preventing mosquitoes from biting humans, with window screens, education on when to stay indoors, and bednets. You are currently browsing the archives for the Geography – Economic category.